Cannon School fourth-grader Michael Sanders of Davidson, N.C., recently completed a busy season of golf. He traveled throughout the Carolinas during the summer and fall to play in tournaments with both the National Junior Golf Club and U.S. Kids Golf. He won at Northstone Country Club in Huntersville (score of 76) and Rocky River Golf Club in Concord (73), placed 2nd at TPC Piper Glen in Charlotte (73), and 3rd at the Club at Irish Creek in Kannapolis (74). Because of his level of play, he qualified for the National Junior Golf Club World Championship, which was played at Sea Trails Resort in Sunset Beach, N.C. over Labor Day weekend. Michael placed 3rd out of 10 boys in his age group. He won a U.S. Kids Golf World Qualifier tournament at Beacon Ridge in Pinehurst, N.C. last summer, which qualified him for the U.S. Kids Golf World Championship in Pinehurst in August. Michael placed 43rd out of 143 boys in the nine-year old division. This fall, he has participated in several other tournaments with the U.S. Kids Golf program. He finished 4th at Highland Creek Golf Club in Charlotte (37 for 9 holes) and 2nd at Cherokee Valley Golf Club in Travelers Rest, S.C, (37 for 9 holes). At River Run, he won his flight in the Junior Club championship and finished his season by winning the Junior Member-Member championship with a 15-year old partner. Cannon School beat Northside Christian Friday and Mt. Zion Saturday to win their own Cannon Classic for the first time in school history. Jarell Eddie and Keith Belfield dominated in both games to give the Cougars the win. Belfield scored 37 and Eddie scored 33 in the 100-72 win over Northside. Eddie also had 10 rebounds and three blocked shots. In the championship game against Mt. Zion, Eddie had another 33-point performance and grabbed nine rebounds. Belfield had 21 points and nine rebounds in the 75-72 win. Belfield and Eddie's younger brother, Jason, made the all-tournament team. Jarell Eddie was named the tournament MVP. Cannon travels to Red Springs on Thursday to play in a tournament hosted by Flora MacDonald Academy. Other teams in the tournament include Quality Education Academy (Winston Salem), Mt. Zion (Durham), Upper Room Christian (Raleigh), Wesleyan Academy (High Point), Christian Faith Academy (Creedmoor) and Red Springs. Several East Lincoln soccer players and coaches earned conference and regional recognition this year. Seniors Chad Salter, Nik Geerken, Eian Fowler, junior Tyler Matner, sophomore Rolando Miranda and freshman Justin Williams earned made the Southern Piedmont All-Conference Team. Williams was named player of the year, and coach Jason Dragoon is coach of the year after leading the Mustangs to a 18-7-1 (9-1) record. Salter, Matner, Geerken and Williams also earned North Carolina Soccer Coaches Association all-region honors and assistant coach Darryl White is the NCSCA Regional assistant coach of the year. The Mustangs made it to the third round of the NCHSAA 2A state playoffs, but lost in sudden death to Salisbury 3-2 on Saturday. The Hopewell boys' basketball team is ranked at the top of the Observer's preseason Sweet 16 basketball poll. The Titans went 29-1 last year, but lost their star player in Brandyn Curry. The Titans have reloaded and look like they will make another deep playoff run this year. Lake Norman is fourth in the poll, Vance fifth and West Charlotte eighth, meaning the new I-Meck Conference will be very competitive this year. Hopewell (No. 12) and Lake Norman (No. 13) also made the preseason girls' Sweet 16. Look for a full basketball preview for both girls' and boys' in the Lake Norman News Wednesday. East Lincoln coach Jason Dragoon will finally shave his mustache. The Mustangs fell to Salisbury 3-2 Saturday night in the third round of the NCHSAA 2A playoffs. Salisbury is ranked No. 9 in the Observer's Sweet 16 soccer poll. They will face Shelby in the quarterfinals. The NCHSAA playoffs started on Friday, with East Lincoln, Hopewell, North Mecklenburg and Lake Norman making the playoffs. North Mecklenburg's third round playoff soccer match against Roberson has been postponed until tomorrow (Thursday) night at 6 p.m. Many local schools are dealing with wet fields after several inches of rain as they prepare for playoff soccer and football games this week. Langston Wertz Jr. over at the Prep Insiders blog has more about the soggy conditions. You read the headline right. Two teams from the Lake Norman Giants Junior Pee Wee Pop Warner league played against each other in the Optimist Bowl Saturday. The Optimist Bowl is essentially the Charlotte-area championship, with teams from all around the area vying for a spot in the game. The team coached by David Serepca beat John Bertone's team 26-0 in the game played at Charlotte Christian. Serepca finished the season 10-0 while Bertone's team finished at 8-2. North Mecklenburg took down conference rival Vance in the second round of the NCHSAA 4A men's soccer playoffs Friday 2-0. East Lincoln also moved on to the third round in the 2A bracket with a win over East Davidson. After upsetting Alexander Central in the first round, Hopewell lost 1-0 in the second round of the 4A playoffs to A.C. Reynolds. North Mecklenburg will face T.C. Roberson and East Lincoln has Salisbury in the third round. The NCHSAA announced football playoff brackets on Saturday. Hopewell, North Mecklenburg and Lake Norman, along with fellow I-Meck members Vance, West Charlotte and Mallard Creek are in the 4AA playoffs. East Lincoln is the No. 3 seed in the 2AA West bracket. Some interesting notes: North Mecklenburg beat Olympic in the first game of the season 41-30, leading to a 5-1 start. Hopewell lost their last match-up with conference foe Mallard Creek 14-41. The first round games will be played Friday. For full playoff brackets, go to www.nchsaa.org. Coach Jason Dragoon will keep his “Hulk Hogan handlebar” mustache for at least a few more days. The East Lincoln men’s soccer coach made a promise to his players after they won the conference that he would grow out his facial hair. He’s not going to shave it until the season is over. The Mustangs ensured that the coach wouldn’t pull out the razor last night with a 2-0 win over Bandys in the first round of the NCHSAA 2A state tournament. The two goals, the first by Justin Williams and the second by Rolando Miranda, came within two minutes of each other early in the first half. East Lincoln (17-6-1, 9-1) continued to attack the entire game, but could never convert and put the game out of reach. “Finishing has been good all year,” said Dragoon. He said it was like his players weren't being greedy enough, passing instead of attacking and shooting. The Mustangs have outscored their opponent 64-36 this year and have eight shutouts. Keeper Austin Putnam recorded the shutout against Bandys (10-9-3). Dragoon credited the lack of scoring to first-round nerves. It’s no surprise that the Mustangs were nervous. Despite going 15-4 in the regular season last year, they lost in the first round of the state tournament to East Davidson, who they will play in the second round on Saturday. Regardless of the history between the two teams, Dragoon is confident that his Mustangs will play will in the next game. His team has been playing very well, winning 12 of their last 13 games. 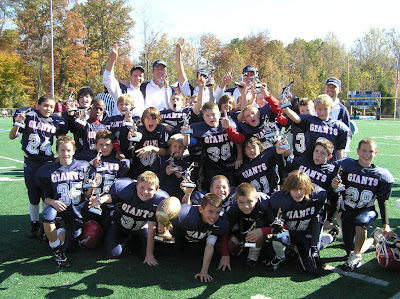 Two Lake Norman Giants Pop Warner teams will face off in the Optimist Bowl in the Junior Pee-Wee division. The teams are coached by John Bertone and David Serepca. "This is the first time that I am aware of that two of our teams from the same age group played each other for the City Championship," said Ron Turner, the Giants' president. The game will be played Saturday at 11 a.m. at Charlotte Christian. One of the other Giants coaches, Tim Wolter, was recognized with the Doc Martin Award for Sportsmanship, given to one team in the Charlotte area for for outstanding sportsmanship. It is voted on by the coaches. In the Nov. 4 Lake Norman News, I published the wrong score in the "Friday's Games" section of the paper for the North Mecklenburg and Mooresville football game. The correct score is North Mecklenburg 35, Mooresville 23. The North Mecklenburg Vikings powered through the first four rounds of the playoffs and looked poised to have a shot at their first state championship. But the Vikings fell one game short, losing to Ardrey Kell in the state semifinals 3-2 (21-25, 25-13, 25-15, 19-25, 8-15). After losing a close first game, North Meck came back strong with commanding wins in the second and third games. But, in the end, Ardrey Kell was able to overpower them and earn a spot in their first state championship game. Cooke had 22 kills, 11 digs and three blocks for the Vikings, and Sarah Weise had 16 kills and served seven aces. Atkinson, who was sidelined midway through the fifth game with a knee injury, had 39 assists. North Meck finished the season 25-3. Ardrey Kell is now 24-5 and will face Greenville Rose in the championship match. Junior Jenny Falcone, of Davidson Day School, won the N.C. Independent Schools state championship Sunday in Wilson, N.C. by defeating Katy Cananda (The Elon School) 6-0, 6-0. This state championship for Jenny caps off an impressive season. Falcone, a Davidson resident who is ranked 59th in the country (Girls 18-under), didn't lose a set the entire season and finished with a game record of 144 wins to 4 losses. The NCHSAA Boys Soccer Tournament brackets were released today. Hopewell will face Alexander Central in the first round, and North Mecklenburg, I-Meck champions, will play South Mecklenburg in the 4A playoffs. In the 2A playoffs, East Lincoln will play Bandys in the first round. First round games will be played Tuesday and Wednesday. Also, North Mecklenburg jumped from 11th to seventh in this week's Observer Sweet 16 Soccer poll. Cross-town rivals North Mecklenburg and Hopewell met for the fourth time this season Saturday in the fourth round of the NCHSAA 4A playoffs. North Meck won the match 3-0 (25-18, 25-23, 25-20) and move on to the semifinals, where they will face Ardrey Kell. Hopewell won the last match between the two in the I-Meck conference finals. Ali Cooke led the Vikings with 16 kills and 21 digs. Blair Atkinson had 10 digs and 31 assists.